Nate’s Bagels Named Best in State | Food and Drink | Style Weekly - Richmond, VA local news, arts, and events. 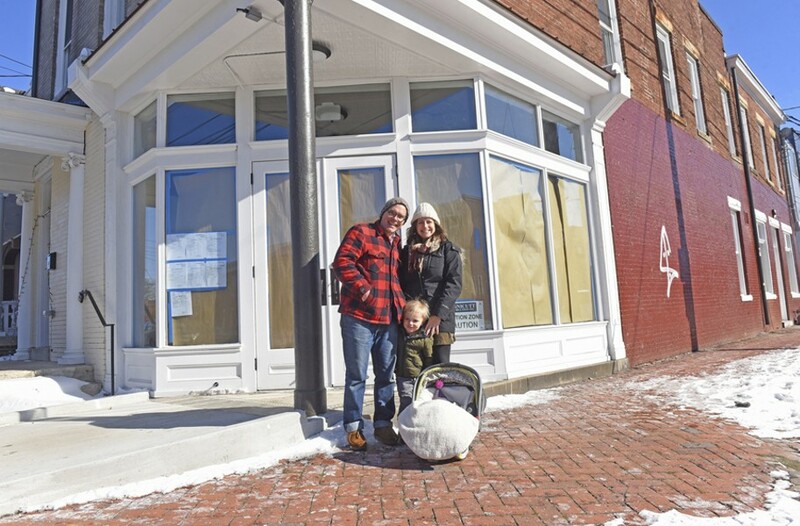 Scott Elmquist Nate and Lauren Mathews — here with children Gus and Millie — operate Nate’s Bagels on South Allen Avenue. Not everyone could make the leap from civil engineer to bagel engineer. After years of designing landfills, Nate Mathews came to a realization two years ago: He could continue with engineering or find something that truly motivated him. After countless bar conversations about the absence of good bagels in Richmond, he decided to rectify that. Step one involved going to New York for a four-hour, amateur baking course on making bagels at home. Over the 36-hour trip, he also visited 12 bagel shops on a quest to not only taste bagels but glean some tips from the pros. The eating was easy, but the information gathering was almost impossible. "It's a bagel mafia up there. It's real," Mathews says with no hint of irony. "I'd ask about ovens and get nothing. Employees lose their jobs for saying anything about how they make bagels." At one shop in Brooklyn, he was advised not to do it because it was "the hardest thing ever." Mathews was undeterred and said so. "Ten cigarette breaks later in the cold, he gave me a few tips," he says. Returning to Richmond, he began the arduous process — how much yeast, how many days to ferment — of making bagels at home, filling binders with notes to record every result. When he burned up his home mixer, he bought a commercial mixer and installed it in the living room. Meanwhile, he was rolling and cutting bagels in the dining room. Because his home oven only fit 16 bagels at a time, he found himself working four to five hours a day to produce 80 bagels daily, all of which were scooped up by friends en route to work. "It was so much math!" he recalls, chuckling. "How many bagels per minute can you roll out, bake, put seeds on?" Life improved significantly last summer when he began working from a commercial kitchen on Hull Street and looking for employees to help with baking and the pop-ups that were introducing Nate's bagels to Richmond. Interviews were conducted at 2 a.m. at the kitchen because he wanted to show potential employees that, "This isn't all fun and games. It's doing hard math on the fly." For bagel lovers, the payoff was found at weekend pop-ups all over town: Three Notch'd Collab House, Charm School Ice Cream, Deep Groove Records, Blue Bee Cider, Roaring Pines and reliably at the Outpost on Fridays, where customers could buy bags of bagels for their weekend needs. Website the Nosher recently listed the best bagels in every state and Nate's Bagels took the Virginia slot. Mathews says he's known since day one that he needed a shop. When he wasn't doing math and baking, he was trolling auction sites for used equipment and squirreling it away in a storage unit. Driving around the city looking for available commercial spaces, he found his happy place on Cary Street at Allen Avenue. To him, it felt like a Brooklyn bagel shop. Local artist Travis Robertson created the logo and is designing custom wallpaper for the shop. The space is galley-style, barely 20 feet wide, and will feature limited seating. Look for an extensive bagel sandwich menu, with Mathews promising homemade pickles and spreads, good pastrami and smoked fish, homemade sodas and an extensive caffeine program featuring Blanchard's Coffee. Ground has just been broken on the kitchen remodeling, with the shop to open in late spring. As a new business owner, Mathews says he's experienced back spasms, teeth grinding and insomnia, all for the cause. "Why is it taking us two years to get open?" he asks. "Because we had to learn at home how to make a Richmond bagel."